More Extras caps: Elijah in costume, laughing…. This sequence captures a brief moment of endearing EW hilarity. When the camera person comes upon Elijah standing off to the side working on the script, he notices that he is being photographed. He explains that he is just going over his lines. An embarrassed giggle breaks into a peal of open laughter. 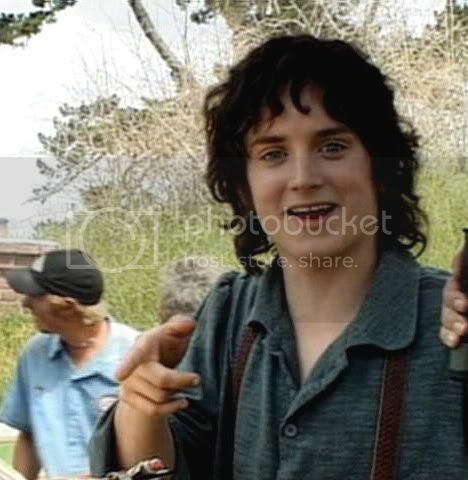 Even though they are technically of Elijah Wood, not Frodo, I love looking at these frames. 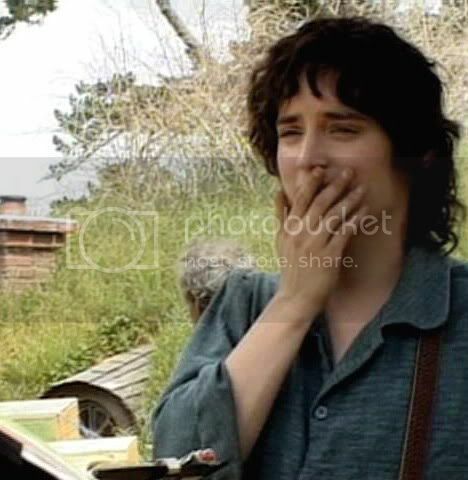 They allow me to imagine that I am seeing Frodo in a moment of high mirth, as if I had happened upon him as stood in a gathering at a Hobbiton party, just as someone told the punch line of a joke. I only wish the camera had been better focussed. Apologies for intruding again, but I find I’m being drawn back here time and again in order to discover what treasures you have unearthed. Without exception, your screencaps are beyond beautiful. Thank you, thank you, thank you… oh, a hundred thank yous would not suffice! I love this latest selection. Elijah in costume but not in character is almost like a separate being - not quite the character and not quite the actor. It’s as if he’s in the midst of a metamorphosis, transforming from Elijah into Frodo. It’s just a delight to see. 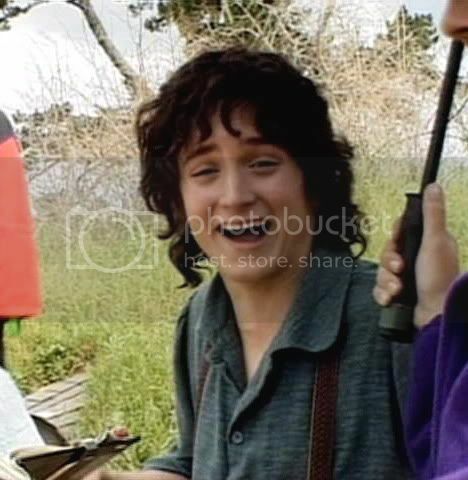 I love your imagined scenario of coming upon Frodo at an informal gathering, when he’s completely joyous and at ease - a happy, carefree young gentle-hobbit. Lovely! I just love running the entries backwards. The sight of him opening his eyes as if he were sensing me watching him, with my feelings plainly visible on my face, is very swoon-inducing. Apologies for intruding again, but I find I’m being drawn back here time and again in order to discover what treasures you have unearthed. 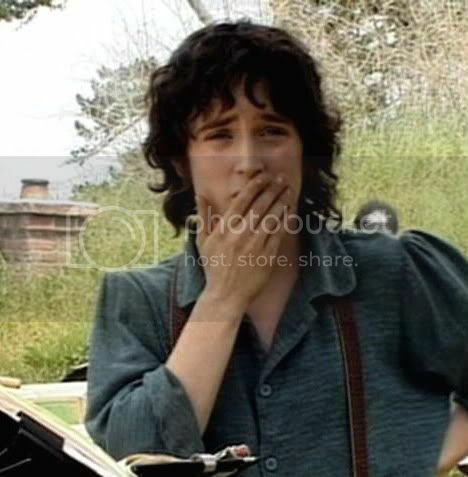 If you read Mariole's post, below, you will see how much difference it makes for Elijah to be actually acting, for his Frodo to exist as a character. I thought she spoke to the issue well. Yes, he looks very different in this. Especially around the eyes, just the way he “holds” his face around the cheekbone/temple area is quite different. But I think it’s more than that. When I looked at this series, Mariole, I wondered if it wasn't from a dress rehearsal; taking lighting levels, etc., rather than a real take. The wig looks as if they hadn't prepped it for continuity, to match the way the wig looks in the rest of the filmed scene. 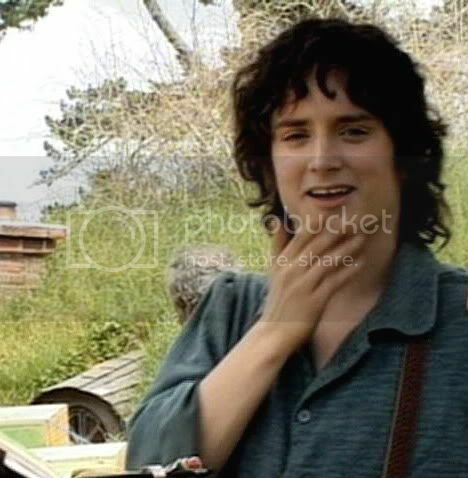 He also does not seem to have his Frodo make-up on. That may enhance the effect of it seeming like, "Elijah with a wig." The over-all blurriness makes it hard to tell. The wig look cruder, like a coarse-outlined smear of dark, and his features a bit muddied. But the "shape" or "silhouette" of the wig does seem different to me. Actually, the way he looks in this sequence reminds me of the way he looks in some of the "cart scene" takes, some of which I posted earlier. 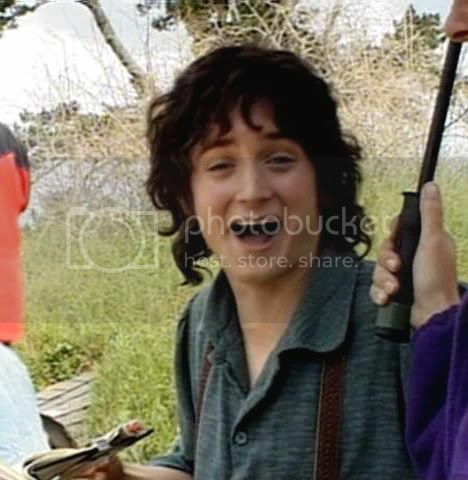 I remarked then that I didn't think film-Frodo looked "like himself" in those shots. Maybe the wig really was styled differently. 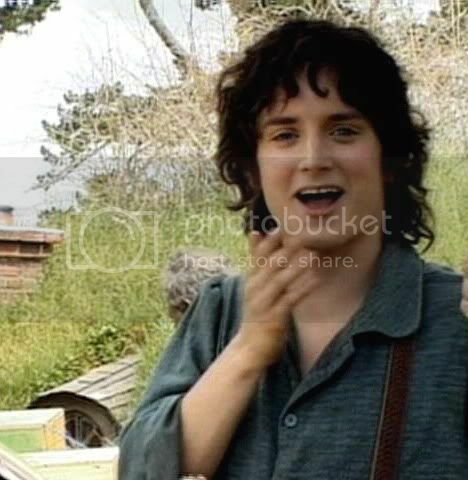 Still, I enjoy imagining the sequence as a little image of, "jovial Frodo". 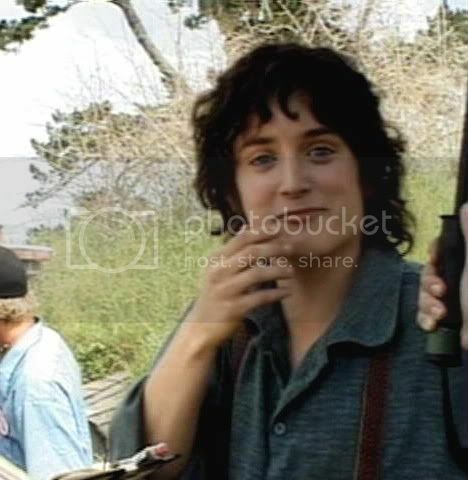 After all, my fanfic Frodo does not look exactly like film-Frodo, either (although there is a strong resemblance *blush*). I have to burst out laughing every time I look at this. How adorable! How could anybody look at this and not be cheered up? You are right though.. he doesn't look like Frodo. It's kind of mysterious how he can turn into him at will though..uncanny in a way. If I squint my eyes a bit though and use my imagination I can pretend that this is Frodo. 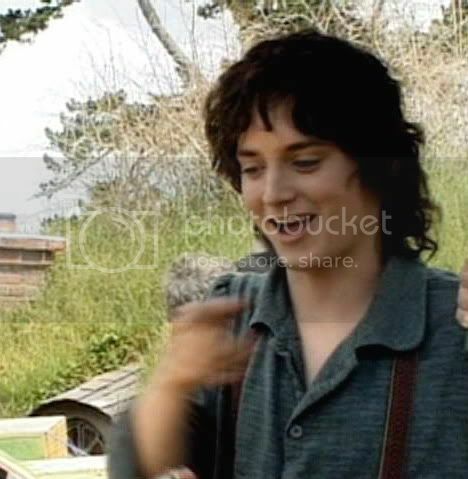 Pictures of him laughing or even smiling are as precious as mithril to me. You are welcome. Yes, laughing pictures are quite rare. I don't mind raiding the "Behind the Scenes" stuff to get them. 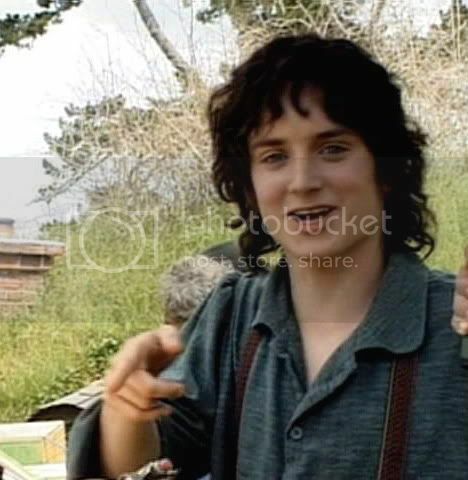 If he doesn't look just like film-Frodo, that's OK. 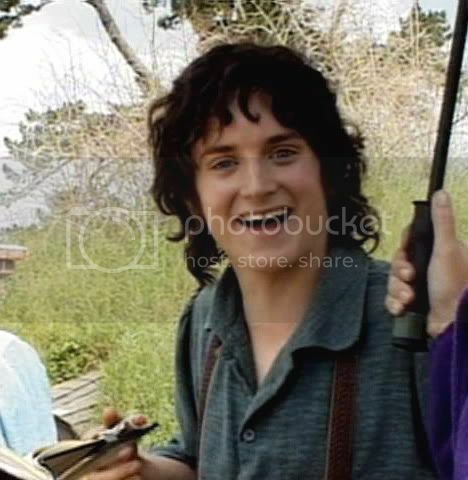 When I am reading and writing, my own inner picture isn't exactly the same as film-Frodo anyway, although it isn't exactly like these shots of Elijah in costume, either. But it's close enough to make these shots evocative of a "happy, early-days Frodo" for me. It's always the same, I am sitting here and I can't but smile. He's a adorable young man, I love those pics. Laughing Elijah-not-yet-Frodo-ones are so very rare. Perfect start into the new day my dear. He looks so very different, very lovely Mechtild. I love your caps, always have and always will. Now I can go for work, this day can't be bad. Thank you so much! I really do love this little series of cap, even if they aren't really Frodo. They are not really Elijah Wood, either. They are some intermediate person, I suppose! That's so true, but I love what I see. He's great! You can hear him laughing and this makes me smile again. What a journal. I'm glad you've been so busy and your journal is that huge. It's a great feeling to know - hey, when work is over you can visit Mechtild again. She'll be there, at home. Keep on smiling sweetie, it's soooo easy here at your place.